With a clarity of vision [they have] preserved and disseminated the unique historical materials documenting the centuries of vibrant Jewish life in Germany and Poland and the destruction of European Jewry during the Shoah. 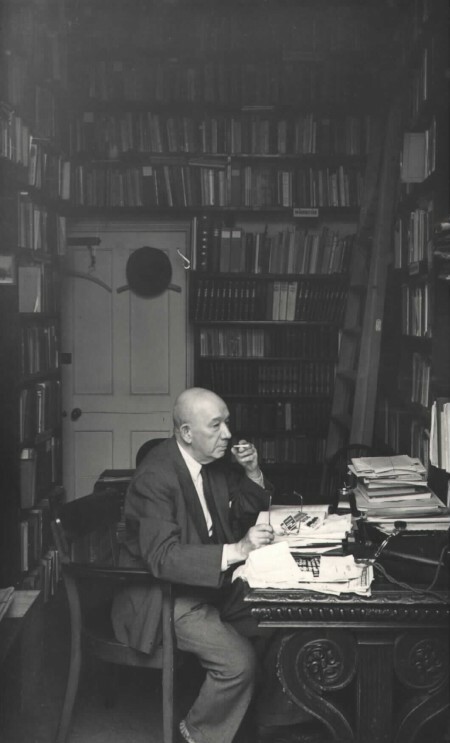 Alfred Wiener at his desk at the Library in Manchester Square, London, UK, in 1953. The Holocaust saw the murder of nearly six million Jews throughout Europe. During that time of war and beyond, two organizations were created to collect information, documents, photographs—anything that contributed to telling the stories and history of European Jewry. The Institute of Contemporary History and Weiner Library and the Jewish Historical Institute are dedicated to preserving their collections and making them available to the public. In 1933, Alfred Wiener left Germany for Amsterdam to escape the Nazis. There he formed the Jewish Central Information Office to gather and distribute information about Nazi activity in Germany. Wiener moved the collection to Manchester Square in London in 1939, allowing his holdings to be utilized by the British government as a source of intelligence on the German situation. The collection grew and became known as “Dr. Wiener’s Library;” it also evolved after the Second World War into a place for academic study of the Holocaust. The Library later provided documents to help the United Nations War Crimes Commission prosecute war criminals, published a bulletin on a range of topics, and began to collect eyewitness accounts of the Second World War to add to the collection. As funding was always an issue, it was agreed that the Wiener Library would move to Tel Aviv, but when money came through to transfer materials to microfilm, most of the holdings stayed in London, with the books going to Israel. Today, housing over a million items such as newspaper clippings, photos, and written works both published and unpublished, the Wiener Library is a leading institution for both scholars and the general public seeking information on the Nazis and the Holocaust. There is a branch of the library in the Jewish Museum in Berlin with duplicate copies of some of the microfilm collection in London. While the Wiener Library covers a wider scope of the Nazis, the Second World War, and the Holocaust, the Jewish Historical Institute focuses on the Jewish population and history in Poland. Its own history goes back to 1929, when the Jewish Historical Commission in Warsaw was established. Emanuel Ringelblum (in whose memory the Jewish Historical Institute is officially named) was instrumental in its creation, which included amassing an important collection of documents from the Warsaw Ghetto that were hidden in milkcans and retrieved after the war, now known as the Ringelblum Archive. In 1944, the Historical Commission became the Central Jewish Historical Commission, which in turn became the Jewish Historical Institute in 1947. It is a research institute for academic study and distribution of information about Polish Jewry. The Jewish Historical Institute focuses on the whole of Jewish life, history, and culture in Poland. Its collections include photographs, art works, books, and journals, as well as an extensive collection of materials, reports, memoirs, and personal accounts of the Holocaust from survivors, as well as the Ringelblum Archive from the Warsaw Ghetto, to document the Second World War era. Together, the Wiener Library and the Jewish Historical Institute serve to keep alive the memories of Jewish history and culture in Europe. They each provide a place for all to visit and study the heritage of European Jewry, and the destruction caused by the Holocaust. Their collections are always growing to provide as much information as possible to all who wish to learn about that tragic era. Professor David Cesarani OBE is an English historian who specialises in Jewish history, especially the Holocaust. He holds the Research Chair in History at Royal Holloway, University of London. Nor does its work stop with the end of Nazism. Sadly the forces that produced Nazism did not perish on 30 April 1945 in the bunker with Hitler. The first nail bomb was targeted at the Afro-Caribbean community in Brixton. It was followed by a detonation in Brick Lane, heartland of London's Bangladeshi population and, not incidentally, the historic matrix of London's Jewish community. Finally, a third explosion tore apart a pub in Soho, Central London, patronised by the gay community and packed with people—straight and gay—enjoying a Friday afternoon drink on the eve of a holiday weekend. Thanks to outstanding detective work by the Metropolitan Police Anti-Terrorism Unit a suspect was arrested a few days later and the bombings have mercifully ceased. The police claim that the arrested man, an engineer aged 22, has no links to organized far-right groups. But was it just coincidence that he attacked Blacks, Asians and Gays? Even if he was acting alone, is it conceivable that he developed this homicidal hate-list from out of thin air? Or was he influenced bv white cower web sites. racist hate literature distributed by mail and on the streets? Was he a member of an, as yet, undisclosed far right group? Today you have honoured an institution - along with its staff, volunteer workers and lay leaders, past and present—which has become a cornerstone of historical research and civic education in Britain. Just as importantly, through the generosity of the Joseph family, you have strengthened this resource for the defence of freedom and tolerance. When the Jews were driven from their homes and massacred the free world did precious little, and what it did do was too small in measure and too late in the day. The world leaders who have sent military forces to counter and we hope reverse the 'ethnic cleansing' in Kosovo are acting, I think, with the example of history before them. They are Schindler's children. One may question the strategy and the tactics of NATO, but the motives for this war are unimpeachable. NATO is giving muscle to the rhetoric 'Nie Wieder'. An account of Ringelblum and his clandestine organization Oyneg Shabes in Warsaw's Jewish ghetto is given in Samuel. D. Kassow's book Who Will Write Our History? : Rediscovering a Hidden Archive from the Warsaw Ghetto, published in 2007.